As I posted on the libreoffice development list, I’m currently working on adding a new option page in the Options dialog, to provide a quick way to switch key bindings between LibreOffice’s default and OpenOffice.org’s for Calc. 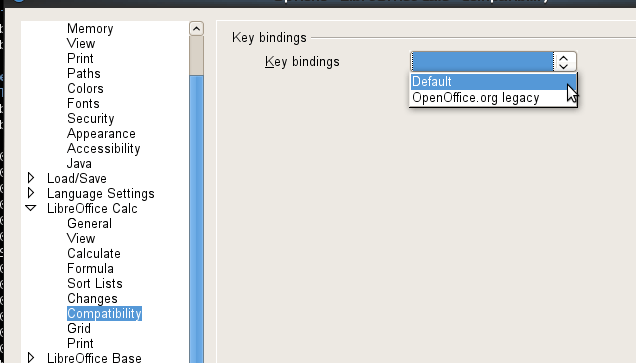 For the most part, the default key bindings are identical between LibreOffice and OpenOffice.org as far as Calc’s concerned, but there are some differences, which are enough to annoy those users who are accustomed to the old key bindings from OOo Calc. but it will not look exactly like this since this is just my first viewable version with no design effort put into it at all. So, hopefully we can morph this into something a little more usable and a little more bearable. Right now, we only deal with key binding compatibility; however, we may expand this page to incorporate other compatibility options in future versions of LibreOffice. What about give on that tab the option to use the English names for Calc functions? >What about give on that tab the option to use the English names for Calc functions? IOW, that functionality has already been ported to LibreOffice. It’s in the Formula options page, though, since it’s not exactly a compatibility option. Please don’t add yet another page to Options. Can this not be simply a “Classic OOo behavior” extension, or at least put under “Customize…”->”Keyboard”? It’s possible to go that route, of course. But does it handle locale specific key bindings too? Some key bindings are different for different locales. And even if we go this route, distributing an extension is not as easy as one might think, and from a usability point of view it’s an extra hassle on user’s part. One thing to note is that, we may need a Compatibility option page anyway for other potentially conflicting compatibility issues. So, I don’t see an issue with having an extra option page. >or at least put under “Customize…”->”Keyboard”? I’d thought about it. The difficulty is that that dialog is shared across all apps and not Calc specific. This has been a source of some frustration over the past day (since I installed LibreOffice). In LibreOffice Delete and Backsapce keys are reversed. Use Delete if you want deleting only the content, Backpace for opening dialog box. This information should be in the integrated LibreOffice help system. Please file a bug about this. Or better yet, work with the documentation team to author a better help content. Please get involved!